Do you wish for a birthday party that will leave your children genuinely amazed? 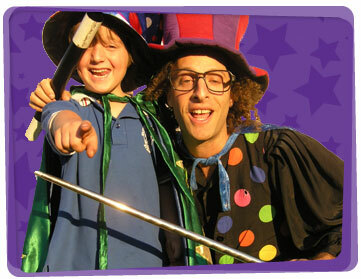 Our Kids Party magicians in Adelaide will not disappoint with their fantastic magic show created especially for kids! Over 18 years we’ve concocted the perfect recipe for a brilliant party and would be thrilled to share it to make your next event a wonderful success! Imagine games, face painting, temporary tattoos, modelled balloon art and lots more all hosted by our experienced magicians for hire. To make sure your birthday child is aware they’re special; they’ll be given a special modelled balloon during the magic show. 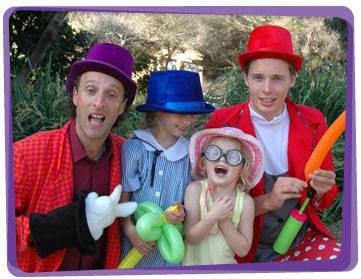 Our Adelaide Magicians for hire have backgrounds in drama and magic and come dressed in brightly coloured, child-friendly, professionally tailored costumes that are sure to please! Let us celebrate with you and bring joy to all your special occasions. 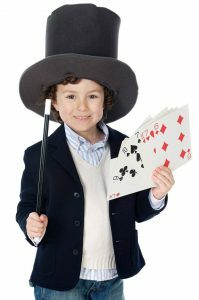 If it’s a birthday party or another event, our Magicians for hire in Adelaide can turn it into something magical for all to enjoy! Exercise the children’s imagination and memory with this magician party game idea! Place 8-10 objects that the kids are familiar with, like a toothbrush, pencil, paper, banana, etc. Arrange them on a tray. Give the kids about 30 seconds to memorize the objects on the tray. Tell them to turn their backs and close their eyes until they hear you say a magic word like “Abracadabra!” While they have their backs turned, take away an object from the tray quickly. When you say “Abracadabra,” the kids face the tray again. Ask the children to raise their hands if they can guess which object is missing. Choose one child to answer. If he/she gets it correctly, then he/she gets a prize and leaves the game. This way, everyone has a chance to guess the missing object and get a prize!